In TFB’s memoirs, there is discussion of a solar eclipse in November 1816. As there were no total eclipses of the sun visible in the UK in the nineteenth century, this must have been a partial eclipse, but there must have been quite a high coverage of the sun’s disc to have caused comment. There is a very interesting website run by the HM Nautical Almanack Office whereby you can find details of every eclipse (both lunar and solar) between 1501 and 2100 AD. By following the links on the site you can choose the year of the eclipse, and which of the several eclipses in that year to choose from. There is also an animation which shows what you would have seen had you been in one of various locations on the day in question. The eclipse of 19th November 1816 was total in Scandinavia but only partial across England and Wales. 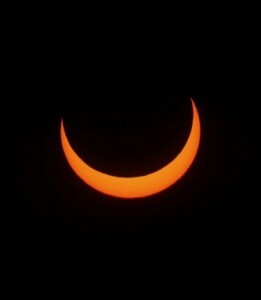 (The eclipse was not visible at all in either Scotland or Ireland). In London on 19th November 1816, the moon’s shadow encroached onto the sun’s disc just after 8 am, reaching its maximum of totality (72% obscuration) just after 9 am and was finished at about 10:17 am. A partial eclipse similar to the one Thomas Fowell Buxton observed in 1816 will occur in the UK on 20th March 2015. The eclipse will begin at 8:21 am and finish at 10:30 am. There will be 85% totality as seen in the south of England, and here’s how it should look. But the further north you will be, the better. At Lerwick in the Shetlands, there will be 96% totality. Let’s hope for a fine day! This entry was posted in Fun on September 16, 2013 by tfb_admin.